Many charities are getting serious about taking steps to become more environmentally friendly in their operations -- to both protect the planet and save money. Some are taking steps to reduce waste in their operations and cut down on their energy use. Others are taking more aggressive steps by undertaking "green" building projects. For many groups, such moves dovetail with their social agendas -- and have the added benefit of building good will with grant makers and other donors. What approaches can charities take to become more environmentally friendly? What are the costs of these efforts and how can your charity get access to funding? How should they publicize them to donors and the public? What should they consider before adopting "green" policies? Cynthia L. Bailie is the director of the Foundation Center's Cleveland office and of the organization's special online initiatives. Ms. Bailie has held leadership positions in libraries and nonprofit organizations since 1991 and serves on the boards of directors for Greater Cleveland Community Shares, the greater Cleveland chapter of the Association of Fundraising Professionals, and the Village Foundation, a community foundation in Bay Village, Ohio. Sarah S. Brophy is a consultant who helps museums, historic houses, and other cultural institutions in New England and the Mid-Atlantic become environmentally and financially sustainable through grants and green performance. She is co-author of the book The Green Museum: A Primer on Environmental Practice. Kimberly Austin is a program associate at the Community Foundation for Greater Atlanta. As part of her role, Ms. Austin is involved in Grants to Green, a new program that provides environmentally focused knowledge and financing to nonprofit groups in metro Atlanta. The program is a collaboration between the Community Foundation, Southface, and Enterprise Community Partners. What are some best practices that you have seen for charities going green? 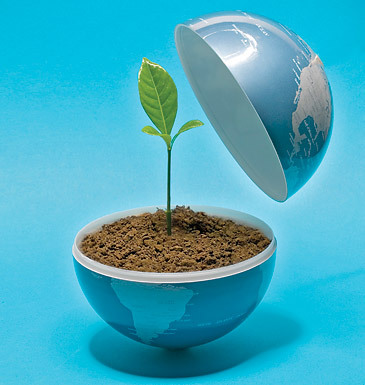 What role should foundations plan to encourage a more environmentally friendly social sector?